Spring has officially sprung. Olivia and I can attest we both woke up early this morning seeking relief from the severely stuffed up noses. Yesterday, I was stuffed up, but nothing like this morning and O went to bed last night tired, whiny, and complaining about her itching eyes and stuffed up nose. Yesterday was Good Friday and we were all off. We used to reset and regroup; Beth and I worked on household chores and the kids played outside. It was a fabulous bright sunny day, yet cool with the sun’s warmth enough to take the chill off an afternoon in the upper fifties or lower sixties. Once the sun set it got cooler and dipped down into the thirties and it was a great night for sleep, unless you were stuffed up suffering from allergies. Eventually, I dropped off and slept well. Yesterday morning, I was sitting on the deck talking to my mom, who lives in my home state – Texas. As we talked, I looked around the back yard and I fully realized how far along Spring is this year. I remember last year the daffodils were in bloom and the trees were just beginning to show their leaf buds. This year, there is tree pollen all over the deck, the daffodils are gone and the lilacs, which are usually a Mother’s Day arrival, are here! Spring always calls to mind memories of flowers and emerging plants. Growing up in Texas I remember the Bluebonnets and Indian Paint Brush along the highways and sometimes even in our yard. Last Sunday morning, Beth called me in to the family room to view the final sequence for the CBS Sunday Morning show, Bluebonnets from Round Top, Texas. It took me back and I could remember drives along the highways looking for flowers. I don’t know if I was a willing rider then, but I would be today! Please excuse the commercial, the vieo is worth it! As an Illinois transplant (and Texas’ one, too) I know little about the Land of Lincoln and its state symbols, except that the state bird is the Cardinal. Recently, Olivia has raided my books and found my state book from my childhood. I found it in her backpack last week and I searched through it to find the state flower, tree, and bird for both states. For Illinois, they are the Burr oak, the Meadow violet, and the Eastern cardinal, respectively. I also learned that Illinois has two nicknames – the land of Lincoln and the Prairie State. Though I already knew both had Native American state names and I knew Texas was derived from Tejas – meaning friend, I discovered the meaning of Illinois was derived from French for the Native American word meaning “tribe of superior men.” Sadly, a tribe of greedy, corrupt men overtook the tribe of superior men and Illinois’ motto should be the Bankrupt State or the State of Corruption. Last weekend, I noticed a robin building a nest in the neighbor’s pine tree and this morning I went out to investigate. I took my camera and shot some my local ‘Spring sightings,’ I hope you enjoy them. Regardless of the political state, it seasonally Spring – very Spring! Today is gonna be a great day – despite the pollen, and tomorrow is likely to be a million and six times better. So, I had better get up, get around, and make it happen. Making the Days Count, one day at a time, one flower, one bud, and even one tissue at a time. What does Spring bring for you? Do you get the sniffles? 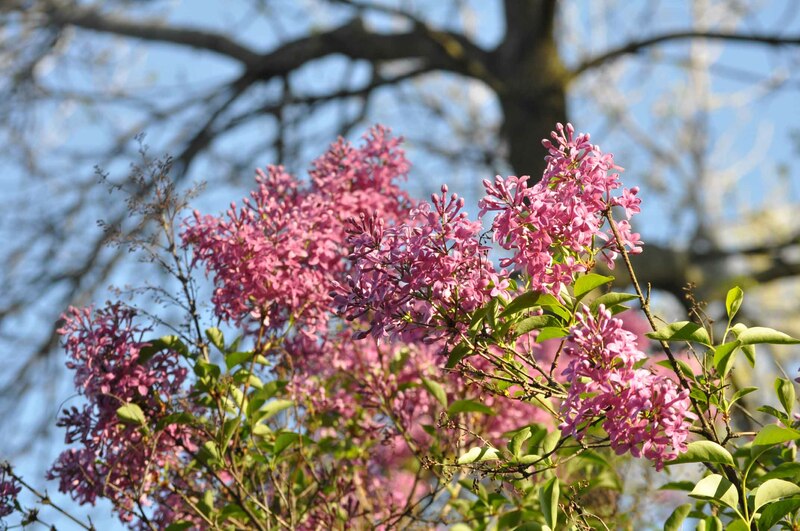 What flowers or ‘Spring sightings’ do you enjoy most? Mom remedy for pollen: Use a saline solution (found in drug store-just plain salt and water but in a nasal spray bottle. About $2.50. I have not had any allery flare ups in 2 years!